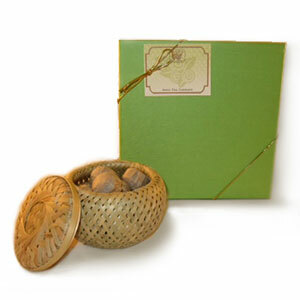 Twenty Mini Tuo Cha nestled into an adorable hand-woven lidded bamboo basket make a unique gift for any tea lover, especially one who enjoys the convenience of a pre-measured ready-to-go tea. The bamboo basket, specially designed to store mini tuo cha, adds to the aesthetics of your tea cabinet or kitchen counter. The gift is packaged in a beautiful gift box with ribbon and a Bana gift tag. For a detailed description of Mini Tuo Cha tea, please click here.